In this article you will find a question and answer style explanation of the four levers of control. I often hear people say that the company is on track. How do they know that? What mechanisms exist that guide the company, its people and its business to stay on track? As a fast growing company in an ever-changing environment your company focuses on the effective utilization of , as R.Simons from Harvard Business School calls it, the four levers of control. For each aspect there is a lever of control to ensure it Stays On Track. 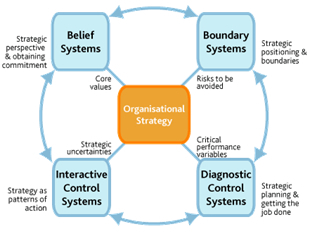 I can see that we are dealing with four sets of systems – the four levers – that work together to ensure that the business strategy stays on track. I recognise some of the terms, but can’t you give me practical examples that will enable me to get a better picture of what the Four Levels of Control consist of in our company. See the link with the symbols and the culture of the company? Remember the balance scorecard? It’s a very useful diagnostic control system…and do you realise that the key result areas process is also a diagnostic control system for individual performance and career management. Those systems that team player skills use to advance and develop. Try some active listening and productive questioning techniques on your customer, you’ll be amazed at what you learn!